Official name: Snowbell Daddy's Girl of Tuitui. Date of birth: 08/05/08 (dd/mm/yy). Breeder: Gayana and Yasantha Wijeyesekera, Snowbell, Dubai, United Arab Emirates (UAE). Imported to Finland in December 2008. - One show result in FIFe: CAC, April 2012. 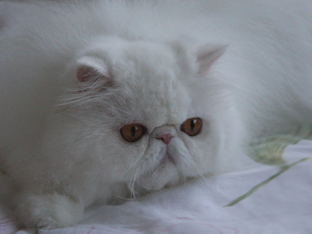 Character: Coco is the most playful and agile Persian cat we have ever known. She is not afraid of anything and enjoys playing with children and helping with her quick-moving paws in every housework like cooking and cleaning. Cats are intended to teach us that not everything has a function.